Here is how to setup an affiliiate for your curated content site. ThirstyAffiliates is a popular link cloaking plugin with a free version at WordPress.org. 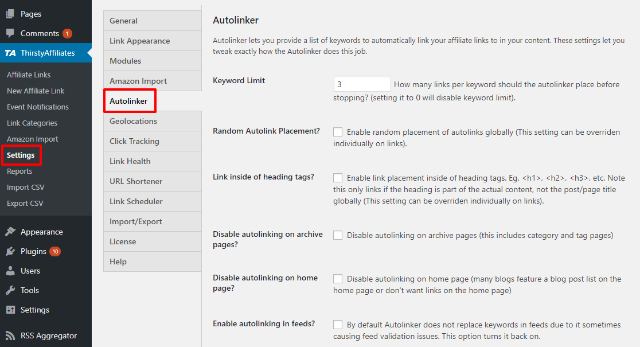 For this article, you’ll need the Pro version, though, because it includes a cool feature that lets you automatically link certain keywords on your site to an affiliate link that you specify. To use it, make sure that you have the Pro version installed (you’ll also need the free version installed in order for Pro to function). Once you’ve done that, scroll down to the Autolink Keywords section to have some fun. In the box, enter the keywords that you want ThirstyAffiliates to automatically link. For example, if you put in “WooCommerce”, ThirstyAffiliates will automatically link the word “WooCommerce” to your affiliate link whenever it appears in content on your site. For some links, you might just want a single keyword, while others you might want to use multiple keywords. Random placement – by default, ThirstyAffiliates will link the first X mentions of the keyword. But if you turn this on, it will just pick X random mentions. Once you’re done, make sure to save your link to make things live. Then, repeat the process for all the different affiliate links that you want to automatically include in your curated content. Once you’ve set up your affiliate links, you’re all done with ThirstyAffiliates. Now, you need to set up your automatic curated content, which you’ll do with WP RSS Aggregator and the Feed To Post add-on. For this section, you’ll need to pick the different sites that you want to curate. I’ll use WP Mayor’s content for the example – but you’ll ideally want to pick content from several different sites to create a true content hub. As the content sources that you added post new content, WP RSS Aggregator will automatically import it. And if that content contains an affiliate link opportunity, ThirstyAffiliates will automatically insert your link.